Spacemaster® SX hoists represent a revolutionary new generation of exceptionally reliable electric wire rope hoists, featuring advanced technology and cutting-edge performance. An innovative design that includes a large drum diameter gives Spacemaster® SX hoists the lowest headrooms and best wheel loads in the industry while providing near true vertical lift with single reeved hoists, and both exceptional hook approaches and heights of lift. Sealed brakes, two-speed hoist motors, and trolley inverter control with a CSA c/us rating as well as a NEMA 3R rating for electrical enclosures. Two-component epoxy paint is standard. Spacemaster® SX hoists are designed to meet and exceed either ASME H3 or ASME H4 duty (FEM 1Am, 2m, or 3m) ratings and provide the ultimate in easy load handling, safe operation and lasting, trouble-free performance. Standard safety features include a electromechanical load limit switch that prevents the lifting of loads that are in excess of 110% of rated capacity. The 4-position hoist limit switch includes an innovative phase mismatch protection circuit that prevents the block from running up and damaging the hoist in the event of phase reversal. Sealed brakes, hardened ground gears, thermal motor protection, exceptional rope life and ergonomic hook block design with sturdy safety latch contribute to the hoist's safe operation and increased reliability. Trolley design reduces wear on components. The automatic disc brake and inverter control help extend the life of the motor and other components, which means less maintenance, less downtime, lower repair costs — and reduced cost over the lifetime of your hoist equipment. Double girder trolley with superior clearance and headroom for double girder crane applications. Normal headroom trolley for monorails and jib crane applications. Hardened wheels for patented track applications are also available. 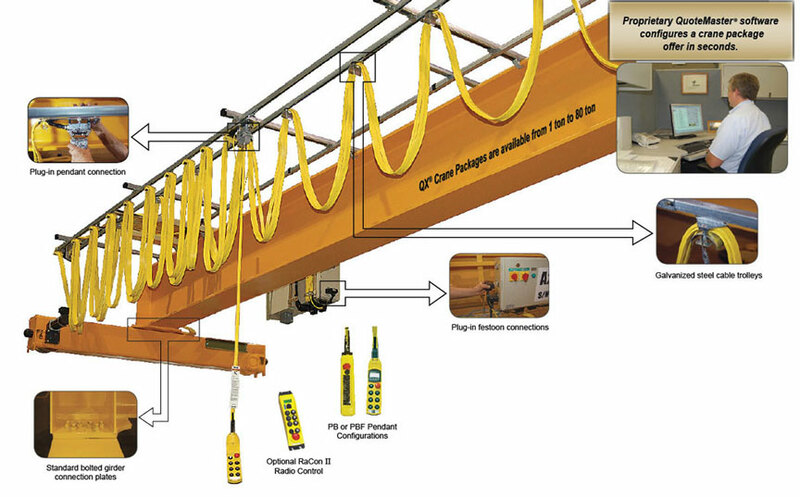 Low headroom trolley for single girder cranes; its compact design provides maximum space-efficiency. Unmatched clearances - the floor area under your new crane can now be used more efficiently. Better hook to wall dimensions (A) compared to the competition. Lower roof heights/maximum lifting heights - Your new building design can be smaller and ore functional giving you savings in initial construction. Better hook to ceiling dimensions (H) compared to the competition. Lower operating costs - Continual savings in heating and/or air conditioning expenses over the lifetime of your building. Maximum flexibility- Factory layout and material flow planning is optimized. Please contact Met-Con today for a quotation on your R&M crane and R&M hoist, overhead lifting, crane and special material handling requirements.